About Skagit Wildlife Area is a 2.7 mile back trail located near Mount Vernon in Washington State, The trail is primarily used for hiking, walking, nature trips, and birding and is best used from April until September. 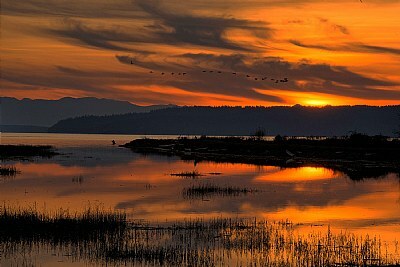 Wonderful hot tones in the sunset with a line of, I think geese, chasing down the sun after spending the day at the lakes. Looks great, well seen.